Pumpkin, pumpkin, pumpkin. I love me some pumpkin. But the main reason I review pumpkin-flavored stuff this time of year is 'cuz 'Muricans got a pumpkin jones! I'm all about other season-appropriate items like cider and apple cinnamon flavored desserts, maybe even more than pumpkin stuff. But there just isn't enough of it out there. Or maybe I'm not looking hard enough. Either way, I'm a happy camper when it comes to fall foods. Sonia and I actually live much farther away from Target now than we used to. We actually have to cross the Delaware River and pay a $5 toll just to go to Target these days...unless we want to drive for almost an hour. So we have to be very choosy when it comes to what items we'll be picking up and reviewing. Not that this blog has been uber-popular, particularly over the past year, but we're still getting a few hundred views a day. So I know somebody's reading. And if you folks who are stumbling on this page care to comment, I'd be happy to look for any particular products that you're curious about—if I can find them. But anyway, I digress. On to the review. These pancakes are really tasty. They're not such a far cry from regular pancakes. Upon perusing the ingredients list, you have to go pretty far down to actually see anything pumpkin or pumpkin-spice related. And the first pumpkinesque things you see are "dried pumpkin flakes." That sounds like something crunchy. And I'm not saying they actually are crunchy...but weirdly enough, there were little crispy pieces on my pancakes. Now, Sonia claims that the super-crispy elements were just due to her excessive use of butter in the pan when we made them. 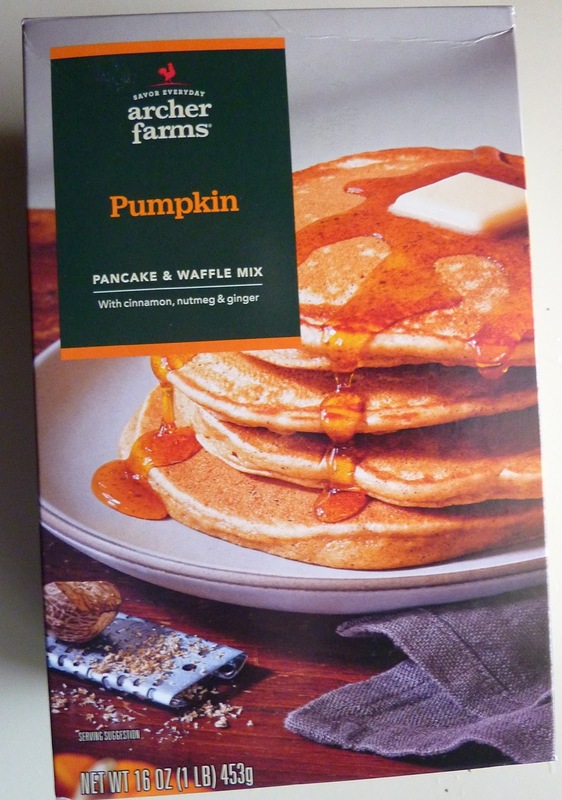 But I almost want to say that the pumpkin flakes added a hint of crispity-crunchitiness to the product, not unlike the minuscule snap one felt while chewing that Cinn-a-burst gum with "flavor crystals," except pumpkin-flavored and way more appetizing than that probably sounds. But other than that, they're only subtly pumpkinny. Spice-wise, Sonia and I felt that nutmeg was the dominant flavor, whereas with most pumpkin spice products, cinnamon is usually a bit more noticeable. We had them with maple syrup, and they were scrumptious. If you're looking for pumpkin-flavored stuff that isn't overly pumpkintastic, this product is a winner. I give it 8 out of 10 stars.